Today we are sharing about our WAND Sales and Marketing Taxonomy, a valuable part of the WAND Taxonomy Library. The WAND Sales and Marketing Taxonomy is a complete foundation taxonomy for a sales and marketing group, greatly expanding upon the terms available in the sales and marketing branch of the WAND General Business Taxonomy. 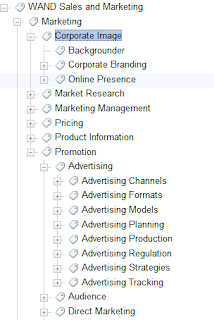 This new taxonomy has 1036 categories and 178 synonyms covering all important sales and marketing concepts including promotion, advertising, market research, pricing, product, market segmentation, sales channels, and much more. As a comparison, the sales and marketing branch in the WAND General Business Taxonomy, available as a free download for users of SharePoint 2010, SharePoint 2013, and SharePoint Online, has just 61 terms for sales and marketing. 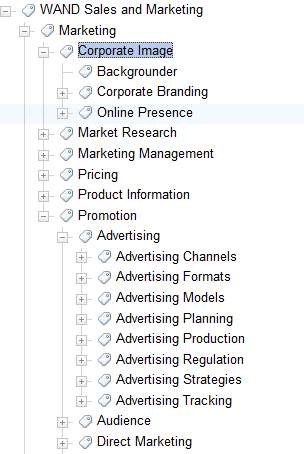 So, this enterprise edition of Sales and Marketing taxonomy is a substantial upgrade to the free set that we offer. If you are trying to tag and organize documents for a sales and marketing group, this taxonomy is ideal as a foundation to get you started. It can be easily customized for your organization with things like specific customer lists, specific sales channels and regions, and more. Starting with a foundation taxonomy is a great time saver. No taxonomy is perfect out of the box, but starting with a foundation taxonomy can speed up the taxonomy creation process substantially. 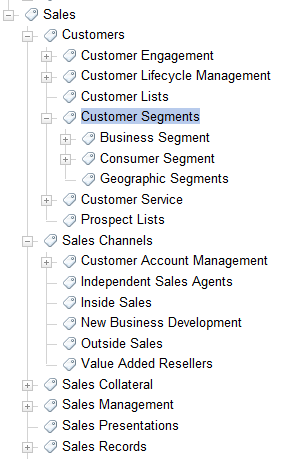 If you'd like to see a demonstration of the new Sales and Marketing Taxonomy, let me know and I'd be happy to do a webmeeting. I can be reached at mleher at wandinc dot com. The Sales and Marketing Taxonomy is available by itself but is also included with access to the WAND Taxonomy Library Portal, which allows customers to browse and download all of the WAND Taxonomies.